Tree based on mitochondrial DNA phylogenies of Steppan et al., (1999) and Kruckenhauser et al., (1999). Armitage, K. B. 1975. Social behavior and population dynamics of marmots. Oikos 26:341-354. Armitage, K. B. 1999. Evolution of sociality in marmots. J. Mamm. 80:1-10. Arnold, W. 1990. The evolution of marmot sociality: II. Cost and benefits of joint hibernation. Behav. Ecol. Sociobiol. 27:239-246. Barash, D. P. 1989. Marmots. Social behavior and ecology. Stanford Univ. Press, Palo Alto, California. Bibikov, D. I. 1996. Die Murmeltiere der Welt. Spektrum Akademischer Verlag, Heidelberg. Black, C. C. 1963. A review of the North American Tertiary Sciuridae. Bull. Mus. Comp. Zool. 130:109-248. Giboulet, O., P. Chevret, R. Ramousse, and F. Catzeflis. 1997. DNA-DNA hybridization evidence for the recent origin of marmots and ground squirrels (Rodentia: Sciuridae). J. Mammal. Evol. 4:271-284. Gromov, I. M., D. I. Bibikov, N. I. Kalabukhov, and M. N. Meier. 1965. Fauna SSSR. Mlekopitayushchie, Volume 3, no. 2. Nazemnye Belich’i (Marmotinae) [Fauna of the USSR. Mammals, Volume 3, no. 2.Ground Squirrels (Marmotinae)]. Nauka, Moscow. Hafner, D. J. 1984. Evolutionary relationships of the Nearctic Sciuridae. Pages 3-23 in The biology of ground-dwelling ground squirrels (J. O. Murie and G. R. Michener, eds.). Univ. Nebraska Press, Lincoln, Nebraska. Hoffmann, R. S., C. G. Anderson, R. W. J. Thorington, and L. R. Heaney. 1993. Family Sciuridae. Pages 419-465 in Mammal species of the world (D. E. Wilson and D. M. Reeder, eds.). Smithsonian Institution Press, Washington, D.C.
Hoffmann, R. S., J. W. Koeppl, and C. F. Nadler. 1979. The relationships of the amphiberingian marmots (Mammalia: Sciuridae). Occas. Pap. Mus. Nat. Hist. Univ. Kansas 83:1-56. Hoffmann, R. S., and C. F. Nadler. 1968. Chromosomes and systematics of some North American species of the genus Marmota (Rodentia: Sciuridae). Experientia 24:740-742. Kruckenhauser, L., W. Pinsker, E. Haring, and W. Arnold. 1999. Marmot phylogeny revisited: molecular evidence for a diphyletic origin of sociality. J. Zool. Syst. Evol. Research 37:49-56. Rausch, R. L., and V. R. Rausch. 1971. The somatic chromosomes of some North American marmots (Sciuridae), with remarks on the relationships of Marmota broweri Hall and Gilmore. Mammalia 35:85-101. Steppan, S. J., M. R. Akhkverdyan, E. A. Lyapunova, D. G. Fraser, N. N. Vorontsov, R. S. Hoffmann, and M. J. Braun. 1999. Molecular phylogeny of the marmots (Rodentia: Sciuridae): tests of evolutionary and biogeographic hypotheses. Syst. Biol., 48:715-734. Thomas, W. K., and S. L. Martin. 1993. A recent origin of marmots. Mol. Phylogenet. Evol. 2:330-336. Vorontsov, N. N., and E. A. Lyapunova. 1984. Genetics and problems of trans- Beringian connections of Holarctic mammals. Pages 441-463 in Beringia in the Cenozoic era (V. L. Kontrimavichus, eds.). Oxonian Press, New Delhi, India. 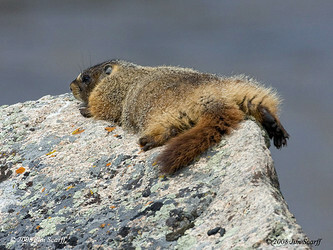 It's so exhausting being a marmot!